Spinal cord injury cases consistently rank as one of the highest-grossing claims for plaintiffs with personal injury cases. Plaintiffs recover on average over $1,000,000 and have a median of approximately $1,000,000 as well in many states. Wonder How Your Spinal Cord Award Will Compare to These? Here is a breakdown of what other spinal cord injury victims have recovered at the national and Illinois levels from data collected from jury verdict reporters and reported settlements. With all of this information, it can be hard to tell what is important and what is not. However, there are some key takeaways from these facts and figures that you should hone in on. 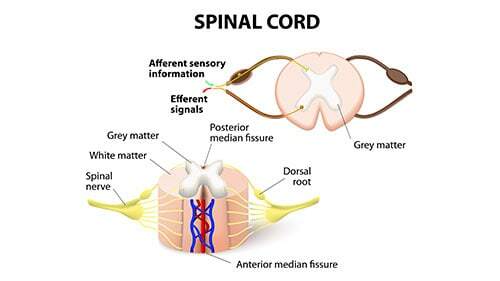 First, notice how so many spinal cord injuries take place in recreational or automobile circumstances. Second, note how Illinois plaintiffs receive awards over $1,000,000 at a far greater rate than plaintiffs with spinal cord injuries from other states-approximately 16% more! Third, and maybe surprisingly, see how there are more spinal cord injury recoveries over $1,000,000 from fall accidents than from sports or motor vehicle accidents. This shows us that, while not as frequent, spinal cord injuries from falls can lead to very lucrative jury awards or settlement amounts. This accident involved a bunch of cars. It occurred on Maple Avenue near Route 83. What exactly happened was disputed. What we know is that the two defendants slammed into each other. Then, they hit the plaintiffs’ car at different times. The plaintiffs were an elderly couple. The wife had just undergone spinal surgery. She was 74. The treatment was just a few months before the crash. She claimed in court later that the incident caused it great pain. It required another operation to fix what happened. Then, there was still great pain. Plus, they had other damages like property damage as well as lost consortium and society. The defendants resorted to pointing fingers. They each thought the other was to blame. The only thing they agreed on was that the plaintiffs were exaggerating their damages. Specifically, they claimed she didn’t suffer as much as she thought. A lot of her pain, they stated, stemmed from the original surgery. It didn’t come from the crash they argued. Yet, with spinal cord injuries like these, it’s nearly impossible to pinpoint where pain started and stopped. The defendants soon realized this. One of them settled. The insurance company for the other litigated the matter. The plaintiffs won by the jury. They received $602,000. Here’s how the jury came to that number. $267,000 for their medical bills. $75,000 for lost normal life. $150,000 for suffering and pain. There was a lot of he-said, she-said in this case. The accident occurred at the Illinois 290-294 juncture. The plaintiff was trying to go from 294 to 290. He was 40 and a carpenter in a union. When he tried to make the move, the defendant’s tractor-trailer hit him. This collision caused the plaintiff a lot of pain. He suffered a spinal injury. Doctors noticed bulging discs, stenosis, and other issues. Plus, they would eventually see degeneration in the spine. The matter at trial turned on how the crash occurred. The defendant driver said the company that loaded it up do so improperly. That company said it was the driver’s fault because he had control of the truck. Neither party really blamed the plaintiff. That was until they got into court. Then, the barrage really came. They alleged he negligently merged, signaled, and drove. All of these errors were the cause of his pain. Plus, his pain was exaggerated in the first place. His future suffering and treatment were greatly exaggerated they made out in trial. None of these moves did well in court. The jury thought the plaintiff was blameless. They awarded him $1,163,227. Here how they calculated that sum. $75,000 for suffering and pain. $35,000 for lost normal life. The victim here was a male. He was 80, and recently admitted to an Illinois nursing home. Doctors warned staff that he was at risk for falls. His assessment noted as much. Thus, staff should have been on high alert. Management should have put in place procedures to avoid falls. That didn’t happen. A couple of months into his stay, he fell down. Staff left him by himself in the bathroom. He fell and broke his spine. The break happened at the C2 spot. That caused a lot of damage. It left him a quadriplegic as well. He didn’t last long. He passed away just months after this happened. His children survived him. He had five of them. They sued the nursing home. They argued it was negligent in its care of him. It should have noted his risk for falls and took proper action. It didn’t. That failure led to this chain of events in their opinion. The nursing home filed a summary reply in court. Yet, the matter was not to be decided by a jury. Both sides settled in a private agreement. The plaintiffs received $700,000 for their losses. Those losses included bills, lost support, and lost companionship among others. This incident was difficult to piece together because the victim had no memory of it. He was riding his motorcycle in McLean County, Illinois. He had a passenger on his back. When they attempted to go through an intersection, an ATV cut them off and clipped them. At least, this is what the passenger said. The man was thrown from his bike. He suffered a spinal cord injury that left him totally paralyzed. His medical bills alone exceeded $1 million. Plus, he could no longer work as a truck driver. That netted him close to $60,000 per year. When they found out the ATV was working at the time, they sued the man’s employer. At court, the defendant denied that the ATV cut them off. However, the passenger had specific and compelling testimony to the contrary. Plus, the plaintiff used expert evidence to prove that he was cut off. After these developments, the defendant was more willing to settle. They entered into private negotiations. The plaintiff received $2,000,000. That was to cover his past and future medical care. It also was to apply to his pain, lost income, and other losses. Rosenfeld Injury Lawyers LLC can help you see how your case will compare to others that have come before it. Of course, your suit will be unique because your accident was unique. However, the past can serve as some form of guide to your case. Contact our offices to understand exactly how.